Invite crystals into your life with an open mind and heart and let them do their job. I have been facinated and continually amazed by crystals for a number of years which is why I have put together some sleep bags. These can be popped under your pillow while you sleep or held and taken around with you in your bag when you feel they are needed. Each crystal has a huge list of benefits which I will go into further detail about in my blog. The list of benefits I have included below fit in with how they will specifically help you and guide you in your existing relationships. 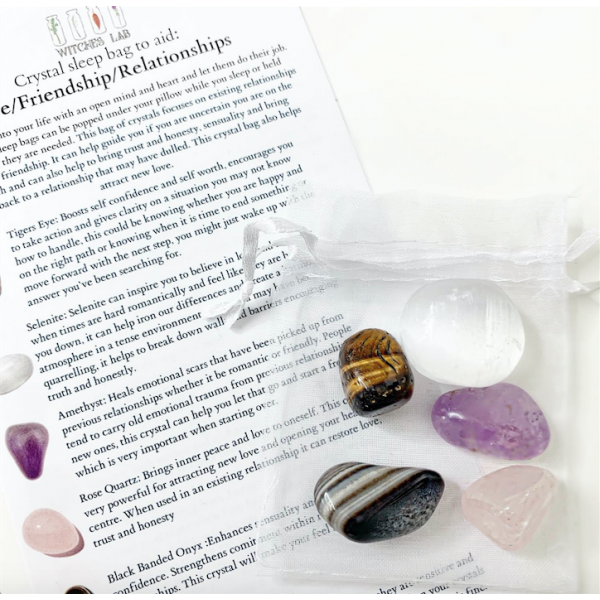 This bag of crystals focuses on existing relationships in love and friendship. It can help guide you if you are uncertain you are on the right path and can also help to bring trust and honesty, sensuality and bring romance back to a relationship that may have dulled. This crystal bag also helps attract new love. Amethyst: Heals emotional scars that have been picked up from previous relationships whether it be romantic or friendly. People tend to carry old emotional trauma from previous relationships into new ones, this crystal can help you let that go and start a fresh which is very important when starting over. Tigers Eye: Boosts self confidence and self worth, encourages you to take action and gives clarity on a situation you may not know how to handle, this could be knowing whether you are happy and on the right path or knowing when it is time to end something or move forward with the next step, you might just wake up with the answer you've been searching for. Selenite: Selenite can inspire you to believe in love and romance when times are hard romantically and feel like they are bringing you down, it can help iron our differences and create a harmonious atmosphere in a tense environment where you may have been quarrelling, it helps to break down walls and barriers encouraging truth and honestly. Black Banded Onyx :Enhances sensuality and boosts sexual confidence. Strengthens comitment within romantic and friendly relationships. This crystal will make your feel attractive and desired. Cleansing and charging your crystals: I have cleansed and charged these crystals myself however they are sensitive and can pick up energies along their journey to you so I recommend when your crystals arrive you can soak them in salt water for 1-24 hours or dry cleanse them by burying them in a bowl of salt or using smoke from a smudging stick (please do not submerge Hematite or Selenite these need to be dry cleansed as they are porous) whenever you feel like your crystals could have picked up or absorbed any negative energies repeat this step again. You can also supercharge your crystals under a full moon by placing them in the moonlight just after sunset ( I will touch more on this in my blog but please feel free to research this online you will find endless information if you are a new crystal owner) Your crystals are yours they will work with your energy and you will feel connected and loving towards your crystals.